Last weekend, celebrity chefs, style experts, and the leading names in home and kitchen products took the stage at the 2015 International Home + Housewares Show. I had a great time meeting up with some brands and clients on upcoming projects I'm working on. I even got a chance to hang out with some celeb chefs I've worked with before! Innovation In Healthy Living and Eating: Convenient products that make healthy living easier are on the rise. Products that align with this trend include kitchen tools that combine technology and functionality and help consumers prepare fruits and vegetables. Evolution of Technology In The Kitchen: Smart kitchen products appeal to consumers because they offer convenience and control. High-tech in the kitchen has advanced rapidly, and quickly, with products that make cooking easier. Multi-Tasking Products That Do More: Consumers, intrigued by the idea of saving money and cabinet space, are becoming more interested in buying one product that serves multiple functions in the kitchen. PC8-PRECISION Stovetop Pressure Cooker ($299) – The All-Clad PC8-PRECISION takes the guess work out of pressure cooking results. The 8.4 quart stovetop pressure cooker provides easy to use technology and features four specific cooking programs specially pre-programmed to ensure success for all recipes, as well as a two-part cooking process which optimizes flavors and texture. The easy to set “smart timer” automatically notifies you when pressure has been achieved and released, along with audible sounds when each step is complete, including when the meal is finished. Hard Anodized Grill/Griddle ($99.99) – This grill/griddle’s ridged surface adds grill marks while draining away excess fat and low sides make the entire surface accessible to simplify turning of foods. It has a grease trough in center separates any excess oils from either side of the vessel. KS22 Kitchen Scale ($99.99) – The KS22 Kitchen Scale provides precise unit measurements in both imperial (oz., fl. oz. and lb.) and metric (g., ml. and kg.). Its TARE function accounts for the weight of an additional bowl, cup or plate. The removable 9” stainless steel plate is also magnetic and dishwasher safe, which is convenient for both professional and at-home chefs. LAUNCHING AUGUST 2015New and improved 10-pc. Nonstick Stainless Steel Set ($799.99) – Set includes a 8” & 10” Fry, 2 & 3 Qt. Saucepan, 3 Qt. Sauté, 8 Qt. Stock Pot. The set is dishwasher and oven safe. Made in the USA. Axia Tri-Ply Stainless Collection ($399.99) – The ultimate combination of performance, design, and comfort for inspired cooking every day. Lagostina’s signature polish shines on the satin finish 18 / 10 stainless steel interior, the brushed stainless exterior and elegant stainless steel lids. Premium three-layer construction combines stainless steel inside and outside with a thick heat-radiating aluminum core for optimal heat distribution throughout the entire pan. Linea Patrimonio (Heritage) Specialty Range ($179.99-$299.99) – Hand crafted in Italy, the Heritage range is a collection of items dedicated to classic, universally renowned Italian dishes. Each piece is specially designed for a particular dish, an invitation to explore the many and varied flavors of the country’s regional cuisine. The Domina Vitamin Pressure Cooker and Saltapasta will launch in Fall 2015. Speckled Induction-Safe Cookware – Made with induction technology, IMUSA’s debut line of induction cookware is safe to use with all stove topes (gas, electric, induction, ceramic, etc.). Featuring various pieces including sauté pans, comals and calderos, available in blue, beige and grey-speckled finishes. Specialty Electrics – Beautifully crafted with a sleek designs, IMUSA’s new line of SDAs includes a 5-cup rice cookers, 10-cup rice cooker with steam stray, slow cooker, 4-cup gourmet espresso maker, electric wok, electric tortilla maker and electric single and double burners. NEW COOKINA Reusable Grilling Sheet: Summer time and the livin’s easy … until you are full body scrubbing your grill after the last BBQ you threw. Never fear, place this product on your grill, get the smoky grill marks you want, and never have a mess to clean again. 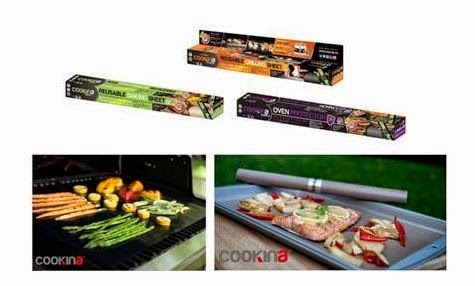 COOKINA Reusable Cooking Sheet: Stop buying parchment paper and aluminum foil to line your bakeware. This reusable sheet is a favorite, and non-stick so no need to line with butter or oil! COOKINA Oven Gard Protector: Never clean the bottom of your oven again. Catch all the gooey messes with ease and simply wipe the non-stick surface with a paper towel for clean-up. Responding to the rapidly growing dehydrator category, Excalibur unveiled dehydrators perfect for the rapidly growing consumer base. Offering options that support categorical growth, while still catering to current customers, Excalibur’s new dehydrators featured varying price points, designs and digital capabilities. NEW Excalibur STL and STS 6-Tray Food Dehydrators: Combining advanced technology with superior drying techniques, the Excalibur STL and STS dehydrators deliver unsurpassed dehydration technology. Featuring a digital controller and interface for ease of use, combined with a 48 hour timer and adjustable thermostat, the STS includes a micro-processor controlled heat sensor that offers improved temperature precision. At a competitive price point, the STS is great for preserving and retaining the nutrients in fresh produce, herbs, meats, and more. Perfect for at-home gardeners, health enthusiasts, hunters, pet owners and more. NEW Excalibur ECB50B Food Dehydrator: Equipped with innovative technology for low temperature food drying, helping to retain the nutrients in fresh produce, herbs, meats, and more. This is a more efficient preservation technique compared to canning or sun-drying. The ECB50B is BPA-Free and equipped with an adjustable thermostat (95F-165F) to provide various temperature options for drying all types of food at a fraction of the cost of store-bought dried snacks. The ECB50B offered at a price point attractive to both novice and seasoned at-home food preservers. NEW Excalibur SVSNEW 3-in-1 Food Slicer: Create healthy and appetizing salads such as potato curls, cucumber spirals, vegetable spaghetti and so much more! Easy to use, the Excalibur 3-in-1 Food Slicer comes with a base and three blades that slice product evenly and consistently, cutting prep time in half. Blades include a flat edge blade for slicing, a fine cut blade for shredding and a coarse cut blade for curling. With easy-to-change blades and disassembly for quick, effortless cleaning, the Excalibur 3-in-1 Food Slicer is the perfect tool for effortless food prep. Since 1985, Omega is the only company to offer centrifuge, masticating, pulp ejection and traditional citrus style juicers. Omega will demo its latest juicing innovations including its self-storing compact “masticating-style” JUICE CUBE - a industry design disrupter with the superior performance synonymous with Omega’s family of high-efficiency and reliable juicers. NEW Omega Juice Cube- CUBE550S: Omega’s Juice Cube is a self-storing compact “masticating-style” juice extractor and more! Make juice, smoothies, all-natural nut butters, baby food, soy milk, almond milk and a variety of healthy snacks. A masticating juicer juices at low speeds of 80 RPM minimizing heat build-up and oxidation. The auger system forces produce into a tight chamber, grinding and pressing the food to squeeze out the juice from items as fine as wheatgrass and leafy vegetables. NEW Omega Twin Gear Juice- TWN30S: Omega’s new Twin Gear juicer crushes, mixes AND squeezes produce to get the highest extraction possible from your produce. With an outlet adjusting knob with spring tension, pressure is created in the machine to squeeze out all the juice from the pulp, which means more juice from your produce! Reduced heat build-up in the juicing process allows the juice to be stored for up to 72 hours with minimal nutrient degradation for a healthier, more nutrient packed juice. Plus, less pre-cutting of produce is required as the gears chop of fibers to save consumers more time. Includes two juice screens which allow for the adjustment of pulp levels. Great for juicing fruits, vegetables, wheatgrass, herbs, nuts for nut milks and more. NEW Omega Stainless Steel Nutrition Center: Beyond transforming fruit and vegetables (including fine items like wheatgrass) into delicious, nutrition packed juices, the Omega Stainless Steel juicer can make smoothies, sorbets and all-natural nut butters, extrude pasta, make soy milk, almond milk and more! This “masticating-style” juicer has an auger system that forces produce into a tight chamber, grinding and pressing the food to squeeze out the juice, ensuring you get the most value from your produce. The stainless steel exterior lends a touch of class to any kitchen.